Along with members of Embry-Riddle Aeronautical University’s Airport Management Club, I had the opportunity to tour Jacksonville International Airport this past weekend. 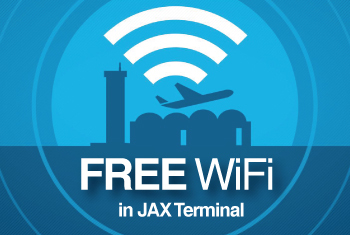 The airport is located about 9 miles north of the business district of Jacksonville, FL, a little ways away (especially from Daytona Beach), but it only took about an hour and a half to make the drive up I-95. We arrived at the terminal and were greeted by a flap-display showing off all the destinations the airport’s eight airlines (including regional affiliates) had to offer. Jacksonville offers some 200 daily arriving and departing flights to various destinations across the continental United States and soon San Juan (on JetBlue Airways). The airport’s passenger air service market has grown significantly, but was not immune to the recession. In 2007, the number of passengers using the airport reached a record of over 6.3 million, but has slipped to 5.6 million in 2009. Yet, judging by the new destinations and forthcoming available seat mileage increases at the airport, I expect Jacksonville to return and pass 2007's 6.3 million in the near future. Just like our tour of Tampa International Airport about a year ago, we went downstairs to learn and observe Jacksonville’s baggage handling system (BHS). For me, it is always fascinating to see where luggage goes after it is checked. If more passengers went behind the scenes, it would certainly change the way they pack. We got up close and personal with the BHS, but my favorite part was going to the baggage handling system control room and learning how the system works in a big-picture sense. This fairly new BHS launched in 2007 and was among the first to incorporate TSA screening into the checked system. At some airports, checked bags must be carried to a TSA screening machine by passengers and dropped off there. With this system, which is slowly being implementing at airports around the U.S., passengers can drop off their luggage at check-in; pretty easy and how it should be, right? Have you ever wondered why the zippers on the your bag are missing or why your bag looks like it just came out of a warzone when retrieved at baggage claim? No two airports have the same identical BHS. Yet most airports’ BHSs (except most small and regional airports) use “diverters” to send your bag to the correct terminal / path. For awhile, many BHSs used the “push” diverters, which would literally slam your bag to the right path. Jacksonville’s BHS uses a different approach, the door method, which reduces wear and tear on your bags. Note, from the video below, that the door has a spinning belt to push your bag to the other belt. Your bag’s baggage tag is scanned by a scanner which alerts the diverter whether or not to open / close the door. Throughout the whole baggage handling system, from City A to City B, major airlines can track where your bag has passed through. Asked about mishandled bags, Jacksonville told us most errors occur due to old baggage tags / bar codes on bags, which confuses the system. The BHS monitor, which allows the control center to see if the BHS is jammed / stopped / blocked at specific points, is pictured below. Following our tour of the BHS we had the opportunity to talk to a TSA screening supervisor at the airport. Of course, to refresh our memories on how TSA works, we went through security; but we were also going through to get to the terminal. 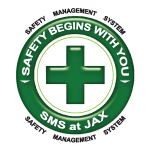 Jacksonville, like many airports in the transition to all-body scanners, offers a mix of both. Travelers who are randomly selected for additional screening go through the body-scanner. When a person is scanned, a TSA agent in another room looks at the body-image and radios the agents working at the body-scanning station where to look if there are areas of question. In the future, there will be a display with a generic figure of a person; certain areas will flash red, meaning that those are the areas needed to be checked. When asked about the number of people requesting pat-downs instead of the body-scanner, the supervisor told us it’s a regular occurrence; and for various reasons. From radiation fears to pacemaker worries, the TSA at Jacksonville told us they’ve already had about 8 or 9 (Saturday morning) request the pat-down. After our conversation with the TSA, we headed downstairs to the “nerve center” of the airport: the operations control room. At the control room, managers have a view of everything and anything that goes on at the airport. Nearly every camera (except TSA cameras) planted around the airport feeds back the control room. Maintenance activities, security and general airport activities are coordinated and managed from this control center. One of my favorite aspects of airport tours is interacting and talking with the airport’s rescue fire fighter (ARFF) team. Like all firefighters in the state of Florida, ARFF crews are certified Emergency Medical Technicians (EMTs). Aside from having experience fighting street fires, ARFF crews have special FAA firefighting training and have experience in special ARFF vehicles. During our visit, most of the crew was studying for an important test, but we were lucky to have two ARFF crew members give us a tour of the station and a demonstration of their trucks. If you’re still reading, bravo! For the remainder of our tour, we were driven around the perimeter / insides of the airport in a Jacksonville International Airport Parking bus. We drove past the fixed base operators (FBOs) Signature Flight Support and SheltAir. Next, we had the opportunity to check out the lighting system for the airport, which allowed us to get a real understanding of how complex lighting an airport can be. At the conclusion of our tour, we drove around the cargo area. There, we found a UPS Boeing 767 and a FedEx Cessna Caravan parked on the ramp. Overall, I really enjoyed Jacksonville International Airport. My thanks to the fine people from the Jacksonville Aviation Authority for giving us this opportunity. It was quite a learning experience and I always enjoy going to new airports!